Developing a well-rounded child involves allowing children to experience opportunities where they can learn more about themselves and their community, broaden their worldview, and participate in clubs that excel and highlight their strengths. Many of the activities we offer have become well-loved annual traditions. Students have an active role in organizing and participating in these activities. We believe that each child has been blessed by God to have certain talents and gifts. The key to unlocking those gifts is to allow the child a chance to shine. Our annual Fall Festival is a festival of friends, family, food, and fun with activities for all ages. From sumo wrestling to gigantic 20-foot high slides and tie-dye shirts to the dunking booth, there’s something for everyone to enjoy. As the school year winds down and students begin to look forward to summer, we have a field day filled with all sorts of fun and challenging, non-competitive activities and games. The only objective? To have as much fun as possible! Teachers and students enjoy the opportunity to spend time together doing activities such as the sack races, long jump, newcomb, and the always popular tug-of-war. All classes have the opportunity to go on field trips at various locations and venues. Middle school students enjoy longer, more involved trips. 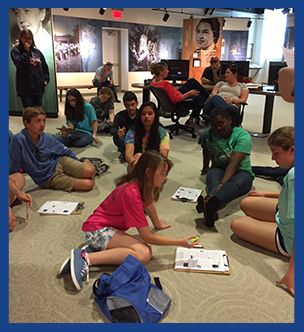 Sixth graders swim with the manatees in Homosassa Springs, seventh graders learn about civil rights and the Civil War in Selma, Alabama, and the eighth grade class travels to Washington, D.C., to learn how our government works. Our younger classes visit museums, exhibits, and plays, for a fun and educational trip. Each year, Redeemer Lutheran School presents a Christmas musical under the direction of our music teacher. Students perform throughout the year in our weekly chapel services as well as special services such as Patriot Day, Grandparents Day, and Easter. Our puppet ministry also participates in our chapel services. We are blessed to have talent among our student performers. Redeemer Lutheran is part of the second largest parochial school system in the United States, with more than 270,000 students enrolled in Lutheran schools across the country. In celebration of our schools, the first week in March is traditionally designated as National Lutheran Schools Week. Thanksgiving is very special at Redeemer Lutheran, and we celebrate with a huge Thanksgiving feast. Each child invites a special guest to eat lunch with him or her before our Thanksgiving break. This traditional turkey meal with all the trimmings is a wonderful time to thank God for all the blessings we receive throughout the year. Over the years, Trunk or Treat has become a tradition at Redeemer Lutheran Church and School as a safe and fun way to enjoy Halloween. Our students love coming to school dressed in their costumes and parading around in the parking lot to collect candy from the trunks of vehicles decorated for the holiday.